Climate-related events after September 8’s RISE for Climate, Jobs and Justice continued seemingly, non-stop, bringing out the faithful who are tireless advocates for a sustainable world. And the efforts of the California faith community and CIPL will continue unabated as we fall into Autumn. Stay tuned! Members of the Watts Task Force display a Certificate of Environmental Recognition from Congressmember Barragan. Photo credit: Corey Burns. 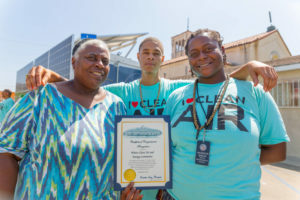 On the same day as the international RISE marches, the Watts Clean Air and Energy Task Force, of which CIPL is a member, held their third EV Ride ‘n’ Drive. Held at St. John’s United Methodist Church, this event brought out faith and community leaders, a number of clean air vehicles and booths that hosted environmental programs as well as kids’ activities. Clean vehicles included the Nissan Leaf and Tesla. A centerpiece of the event was the official switching on of St. John’s first solar system, a highlight celebrated by church and community members alike. 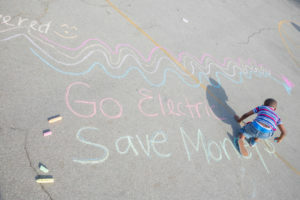 A child demonstrates Watts’ environmental leadership. Photo credit: Corey Burns. Eric Tell, a former resident of Watts and member of St. John’s, brought his Tesla. He sent the Task Force an email after the event expressing his admiration, writing “I’m very happy to have been there. It was an amazing event at a church that has been at the forefront of progress and community development/togetherness for decades. I’ve seen first-hand how St. John’s has stepped out and led in areas from feeding the community and providing a safe space for children in the summer, to educational programs aimed at general literacy and biblical literacy.” Thanks to its embrace of sustainable measures, St. John’s can add environmental leadership to the list. 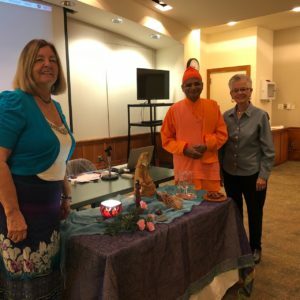 (from left) Christine Monroe, Swami Tattwamayananda and Angie Dickson with the earth altar at the Prayer Workshop. From September 12 to September 14, the international community came together in San Francisco for the Global Climate Action Summit. 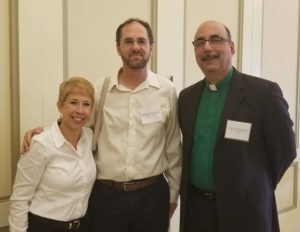 The faith community, largely organized by Interfaith Power & Light, the Episcopal Diocese of California and GreenFaith, assisted in planning and presenting the multi-faith service that preceded the opening of the Summit, as well as multiple affiliated faith workshops. CIPL staff helped to present several of the workshops, including one called “Act as if everything depends on you and pray as if everything depends on God.” In this workshop, a communal, weekly prayer was launched called “Global Ten Prayer,” which focuses prayers from multiple faith traditions on to current and on-going environmental challenges from a changing climate. Do you have favorite prayers for Creation that you’d like to see added to our list and/or a situation to pray for? Send an email to allis@interfaithpower.org. A rally in support of Clean Cars Standards was held prior to the EPA/NHTSA Hearing in Fresno. 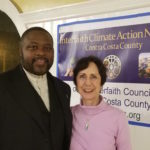 On September 24, members of the faith community came to Fresno for the first of three hearings on the proposed rollback of the Clean Cars Standards. In August 2012, the Obama Administration finalized ground-breaking standards, increasing the fuel efficiency of cars and light-duty trucks to 54.5 mpg by model year 2025. This mpg standard would take place in phases, slowly ramping up fuel efficiency, and was agreed upon in many negotiations with the EPA, National Highway Traffic Safety Administration (NHTSA) and automakers. IPL President Rev. Susan Guy, staff Bill Bradlee, and Rev. Ara Guekguezian of Fresno spoke eloquently at the EPA/NHTSA Hearing in Fresno. CIPL staff member Allis Druffel was thrilled to travel from L.A. to Fresno in a Honda Clarity Hydrogen Fuel Cell car. The Fresno EPA/NHTSA brought more than 100 advocates. Comment after comment were in support of keeping the Clean Cars Standards in place as is with no deviation. Faith leaders, including Rev. Susan Hendershot, president of IPL, and Rev. Ara Guekguzian of Fresno, along with representatives from equity, policy, business, environmental and public health sectors were on hand. They hammered home common themes of protection of public health, increase in clean energy jobs, and lowered fuel and service costs. In fact, 99% of the commenters urged the EPA and NHTSA to withdraw the proposal to rollback the standards. Tell Trump you support the Clean Cars standards, too. Leaders from IPL, United Methodist Women, and United Church of Christ deliver a petition signed by 4,500 people of faith to Ford Motor urging its unwavering support of the Clean Cars Standards. On September 25, a CIPL webinar aimed at the Los Angeles County faithful, presented several resources for congregations and their members. You can check them out, too! 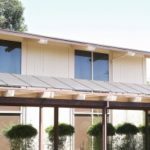 The Los Angeles Department of Water and Power’s (LADWP’s) Direct Install Program provides a free assessment of your congregation(‘)s’ facility(ies) and free energy and water efficiency measures. The Low-Income Weatherization Program offers a free home assessment and free energy and water-efficiency measures to region and income-qualified households. 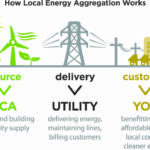 Our colleagues at Sunistics presented information of facility Demand Charges, how your facility uses energy, and how you are charged by your utility company. They also gave overview information of solar and battery storage. Contact a Sunistics representative and get a free analysis of your congregation’s energy use and Demand Charges.